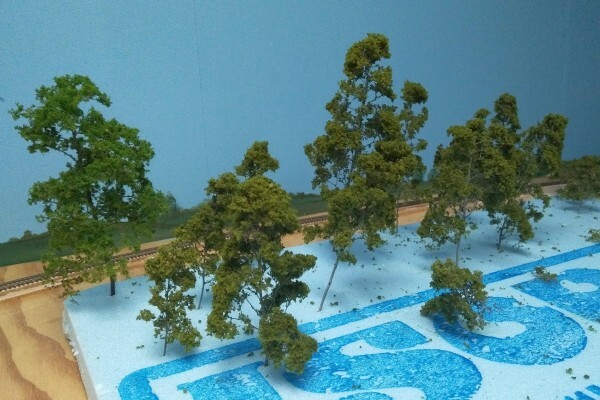 In my previous post I mentioned that I have 'discontinued' one of my passenger trains (Trains 5 and 6), and rearranged the consists of the other passenger trains to more accurately model the trains that they are based on. Rather than leave a hole in the timetable, I added an extra through freight - well, two actually, one in each direction. 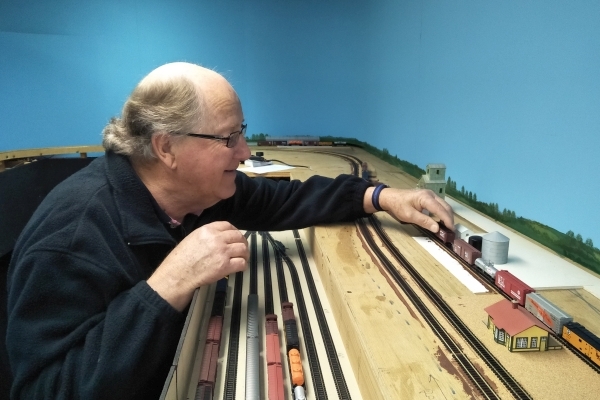 My initial plan was to simply have these through freights run on the discontinued passenger trains' schedules which would have required very little change to the timetable and the associated train instructions. And so, I sent out the invitations to an operating session to be held on 26th March, and set to work rewriting the necessary instructions. Then, just three days before the session, I had a flash of brilliance stupidity. 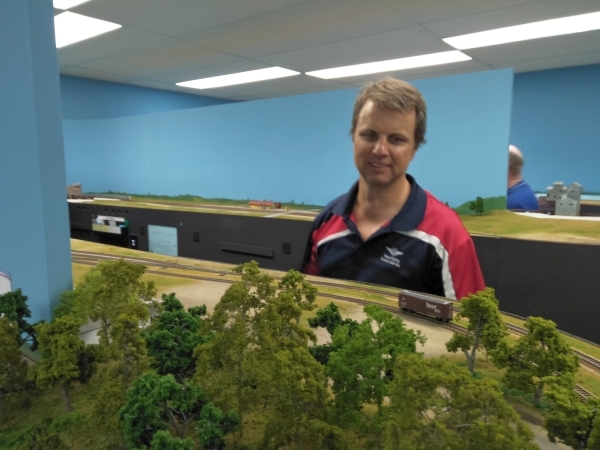 Instead of scheduling these two new freight trains to run non-stop from staging to staging, why not have them stop at the yards to pick up and set out cars that are moving between the yards. In the past those cars were moved by the Fast Freights (Trains 37, 38, 39 and 40), but they were often forgotten about. So I spent the last few days before the session hurriedly adjusting the timetable and rewriting train instructions. Before the session started I warned the guys that there were probably errors in the instructions, and to watch out for possible problems. I figured that I would just trouble-shoot them as they arise, like I always do. 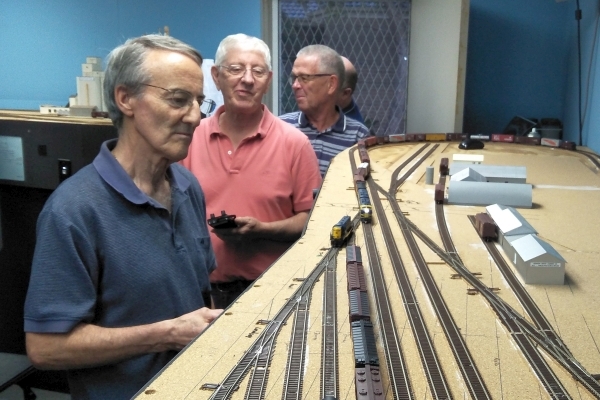 What I didn't take into account was that I had only one experienced yard operator (John C) for the session, and it therefore fell to me to run the other yard. 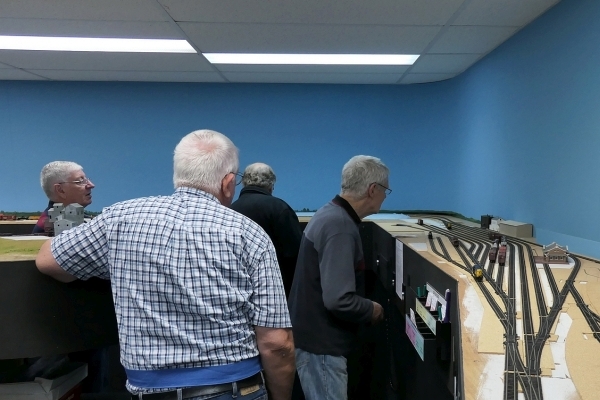 The feedback I received from the operators was that they had a good time, but I personally found the session to be very stressful. The Pauls Valley local freight is preparing to depart Pauls Valley. rumbles past on the main track. 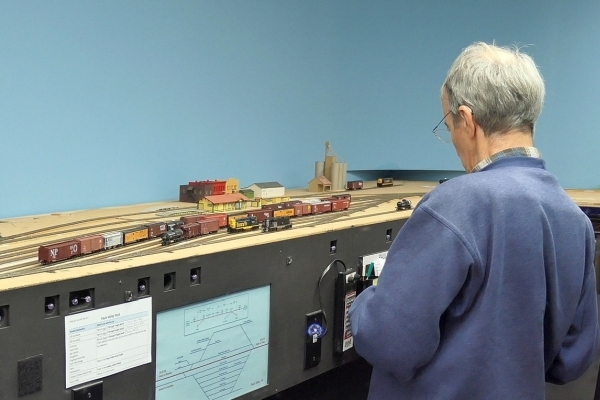 and yard operator John C.
Bill is checking the turnout alignment as he brings the gravel train into Dougherty. (L-R) Rod, Peter K and me. 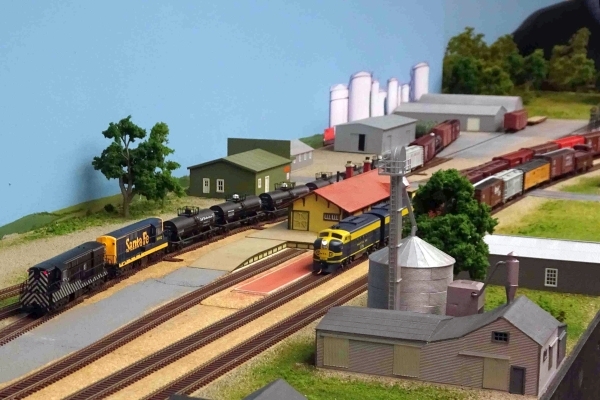 moves a train into the north staging yard. to run to Pauls Valley yard. a train he is about to run from staging. Ooops ... Graham had some sort of problem with the cars at Gene Autry. ... and ... another problem with the cars at Big Canyon. Looks like no grain spilled from those grain cars. John C is working the yard at Pauls Valley. and for some reason I kinda like it. next train from north staging. he is about to run through town. bringing the train into Pauls Valley. Derek is a new crew-member, and he brought with him a camera that does image-stacking in the camera. Yowzers! It produces some impressive photos, but you do have to be careful when you're taking candid photos. Here are two photos that Derek took looking along Pauls Valley yard. The distance from the stock car in the left foreground to the elevator barely visible in the background is about 14' (4 metres). In the second photo you can see that Chris moved his hand a little while the camera was taking the six images that it would use for the stacked photo. 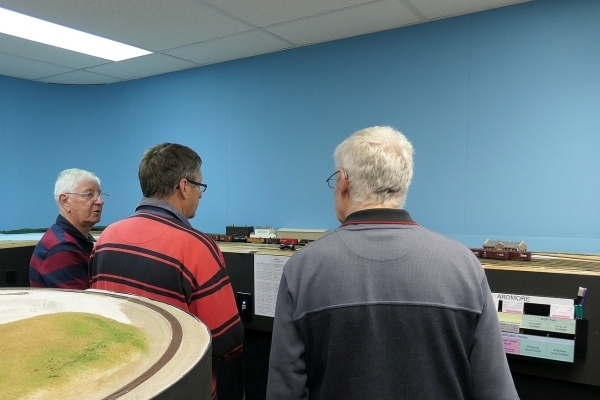 Thanks also to all the guys for coming over to run trains, and for tolerating my crankiness when things started to get tough (for me). 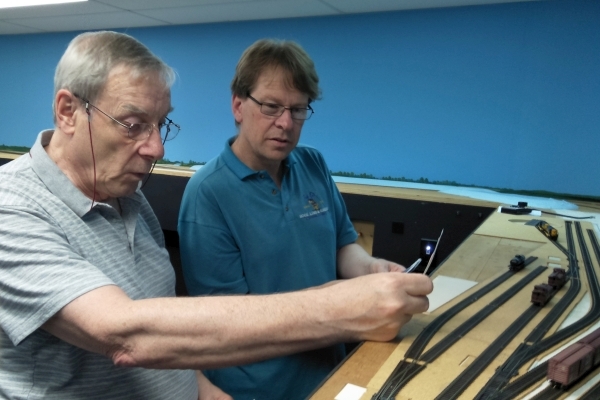 I'm not sure when my next session will be as I have a bit of work to do repairing/replacing one of the failed turnouts, and correcting the problems with the instructions. 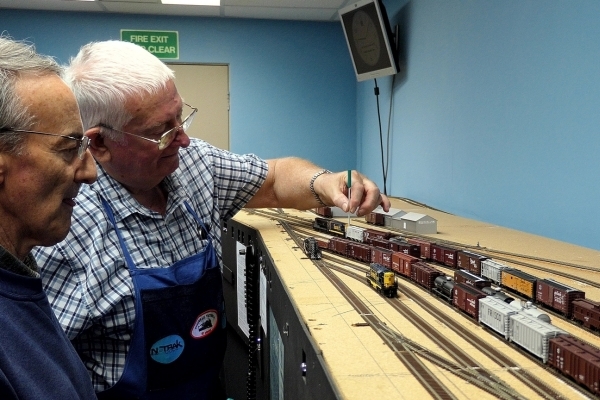 GC&SF passenger trains get a make-over. - Trains 15 and 16 - the Texas Chief. In reality, I've been cheating, as Trains 5/6 and 11/12 didn't (as far as I can tell) operate through the area I model at the same time. From what I can gather from Loren Joplin's website, Trains 5 and 6 (the Ranger) operated between Kansas City and points in Texas (via connecting trains) until they were discontinued in late May of 1960. At that time, Trains 11 and 12 had their routes extended to cover the territory that was previously covered by the Ranger. I've never specified when in 1960 my layout is set, but if that date is prior to late May then I should have Trains 5/6 and 15/16. And if it is June or later then I should have Trains 11/12 and 15/16. - Trains 5/6 mainly carried mail and express, and short-distance passenger travel. 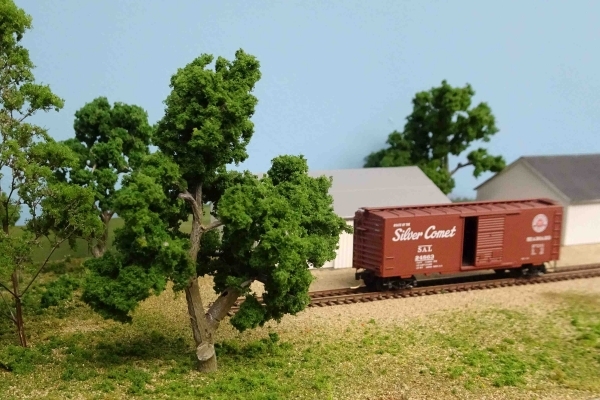 Thanks to Kato and Con-Cor, models are now available for many types of ATSF passenger cars, so I decided to see how accurately I could represent those that I run on my layout. I started with the car lists shown on the previously mentioned website. 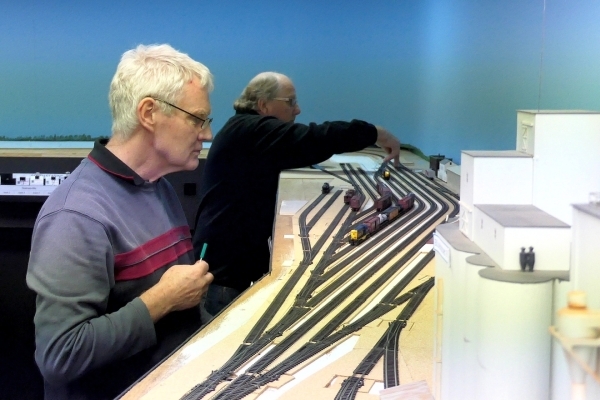 The lists are a bit confusing as they show all the cars that operated in a train, but the actual make-up at any point along the route varied due to cars being added and/or removed as it progressed. 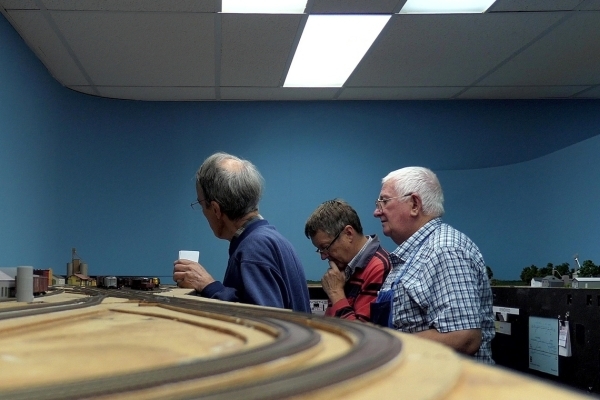 Trains 15/16: I have suitable models of most of the cars and reasonable stand-ins for those that I am missing. 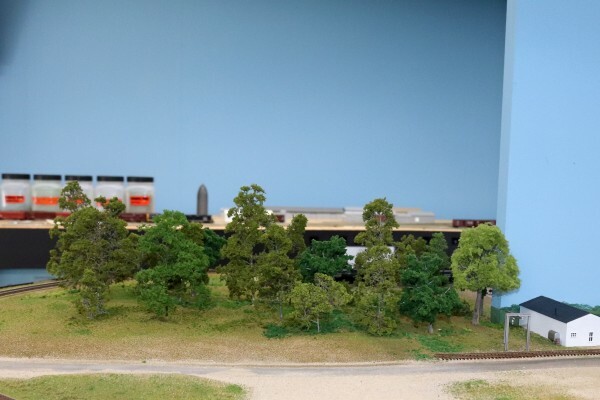 However, at Ardmore the real train had 14 cars in its consist, so I would have to omit a few cars for it to operate on my layout. 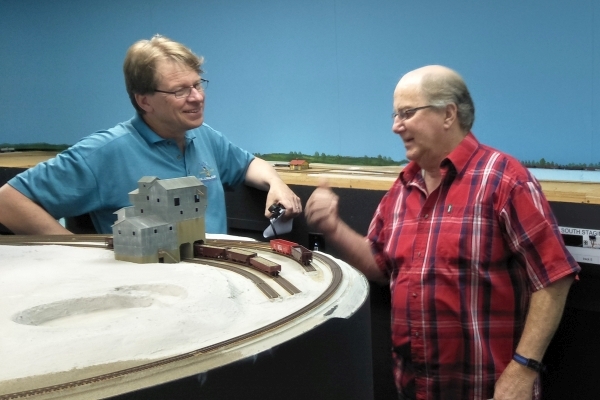 Trains 11/12: I have models of some of the cars, and reasonable stand-ins for most of the rest. I still need a couple more baggage cars or 50' express box cars. 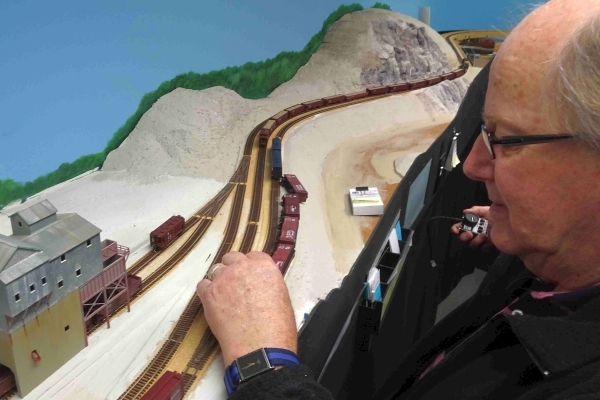 I also need models of ATSF chair cars but RTR models of suitable cars have not been produced in N scale. Trains 5/6: These trains were heavy on mail and express cars, and I need more baggage cars and 50' express box cars to represent them. Also, in 1960 these trains included a pair of heavy-weight chair cars, and I have nothing that I can use as a stand-in. As I mentioned, Trains 5 and 6 were discontinued in May 1960, and I have decided to do the same thing. 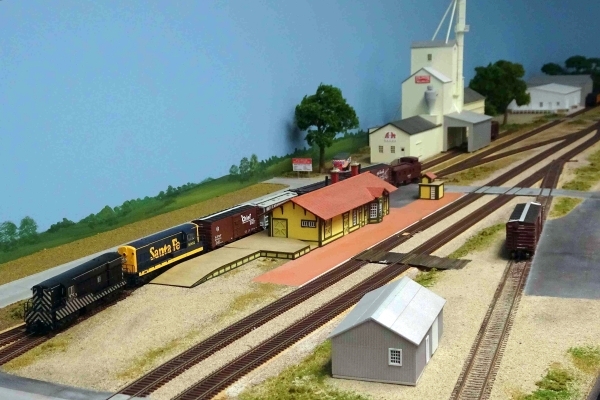 Consequently, my layout is now set sometime in the period June to December, 1960. This process has corrected some long-standing anomalies with my passenger trains, but left a couple of gaps in my operating timetable. But those gaps were quickly filled. The real southbound Fast Freights 37 and 39 were so busy that they often had to be run in two sections. 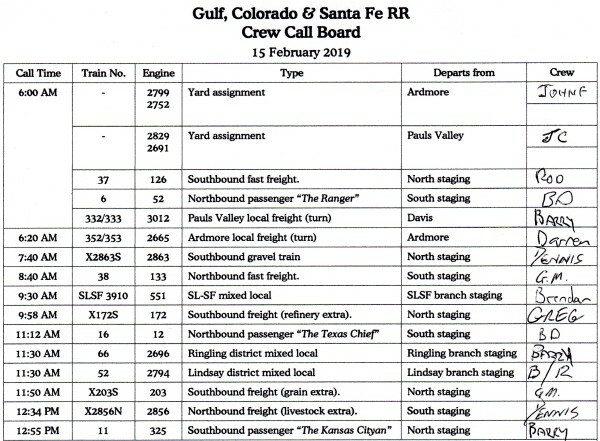 The Santa Fe eventually added two additional southbound freight trains - Trains 337 and 339, to handle the extra traffic. Following their lead, I have added Train 337 (southbound) and Train 338 (northbound) to replace Trains 5 and 6 in the timetable. Train 338 is actually not prototypically correct: I had to create it to fill the timetable gap left by deleting Train 6's northbound journey, and to get Train 337 back to north staging. These new trains have simply slotted into the former Train 5/6 positions on my timetable. They don't do any switching - they just run from staging to staging. It took a bit of effort, but I think (hope, really) that I've correctly amended all the paperwork necessary to reflect these changes. We'll have to wait for the March operating session to see how that works out. 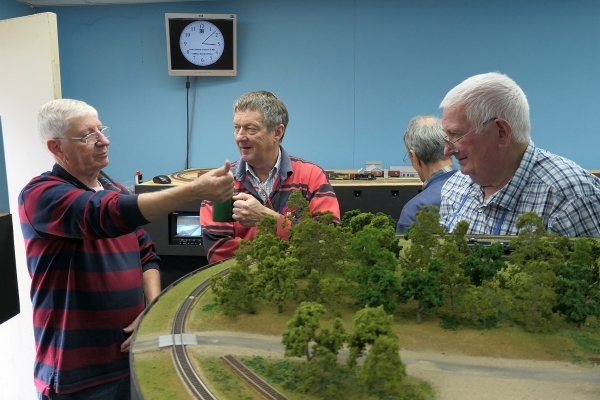 Wow - it has been a long time since I last invited a crew over to run trains on the GC&SF (way back in June last year.) But I finally got myself organised and hosted a session last Friday evening. Things went pretty smoothly overall, with the crew completing the assigned work with very few problems. However, there were a few glitches caused by myself. 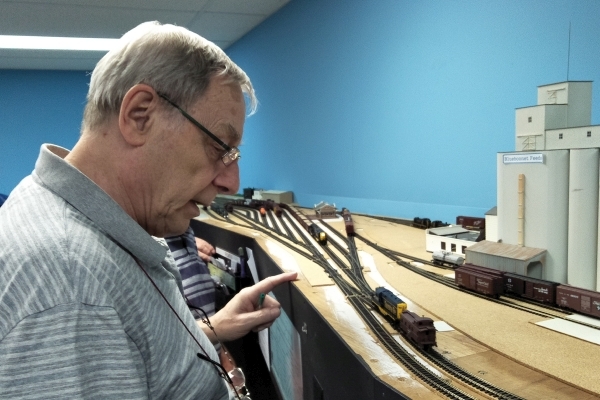 First off, when I staged the gravel train in the north-staging yard (which has video cameras monitoring the tracks) I placed the (DCC) lead loco second in the consist, facing the rear. When the driver started the train, instead of running forward and out of staging, the train went backwards and disappeared from view on the video monitor. 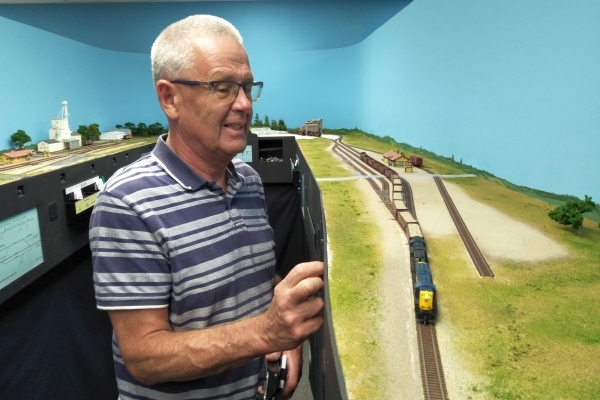 The driver didn't notice what had happened, and consequently couldn't figure out which train he was supposed to be running, as none of the visible trains were responding to his throttle commands. Fortunately, he stopped the train and called me for assistance before anything serious happened in staging. The second incident happened when I reached under the layout to turn on an outside light, but inadvertently switched off the room power by mistake. Then, for some unknown reason, the power would not come back on again. 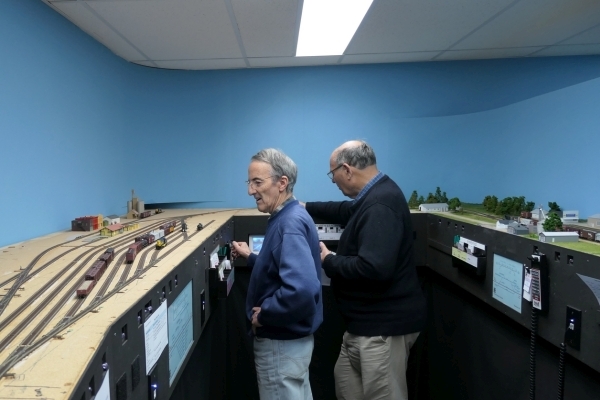 After a delay of about 10 minutes, and checking and resetting circuit breakers, I got the power on again and we were able to resume running trains. But the difficulty I had in getting things restarted again suggests that I have an electrical problem that needs correcting. Apart from those two problems (which took only about twenty minutes of my time to fix), the session went so well that it was over almost before I knew it. I was watching one of the trains and realised with some surprise that it was the Livestock Extra - the second-last train on my schedule. My initial thought was that someone had run it out of sequence, but a check of the crew call-board told me otherwise. 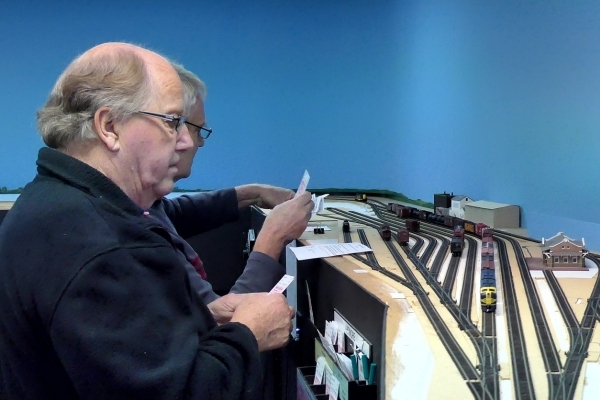 Barry preparing to run a local at Davis. 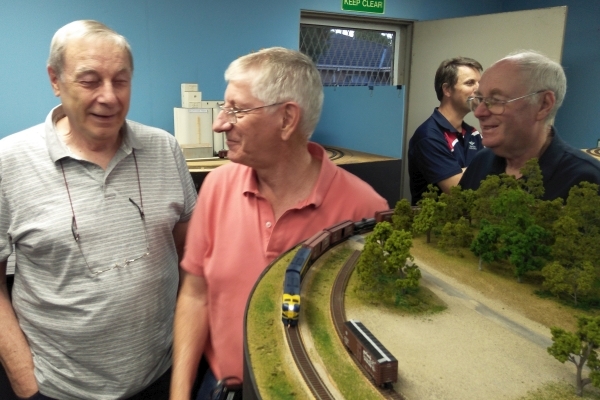 Darren and Graham waiting to run their first trains for the evening. 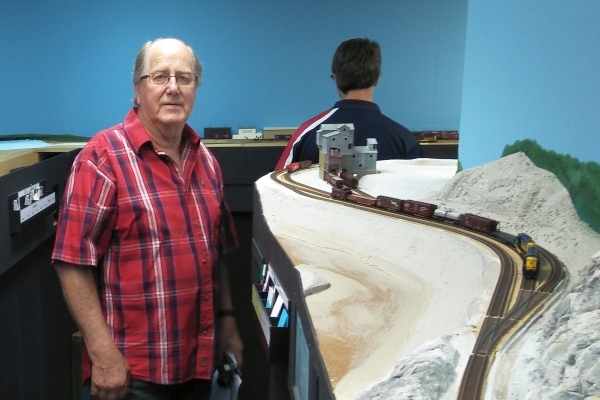 John C (yardmaster at Pauls Valley) waiting for a southbound freight operated by Rod to pull onto the arrival track. 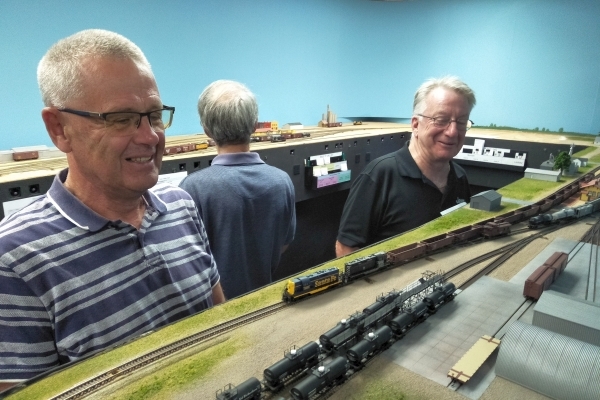 Bill watching as Rod and John work the southbound freight at Pauls Valley. 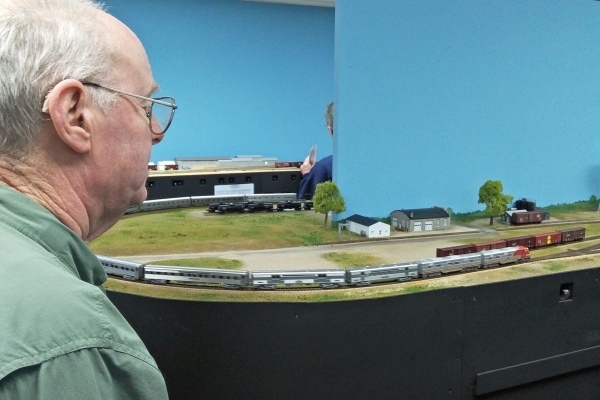 Dennis is watching on as Barry brings the local freight into Wynnewood. 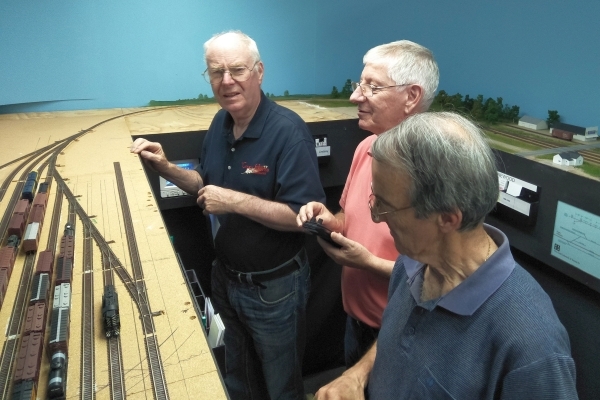 John F, Rod and Bill, with the southbound through freight approaching Davis. empty gons bound for Dougherty and Big Canyon (operated by Dennis) can pass. its switching and is waiting for the through freight to pass. 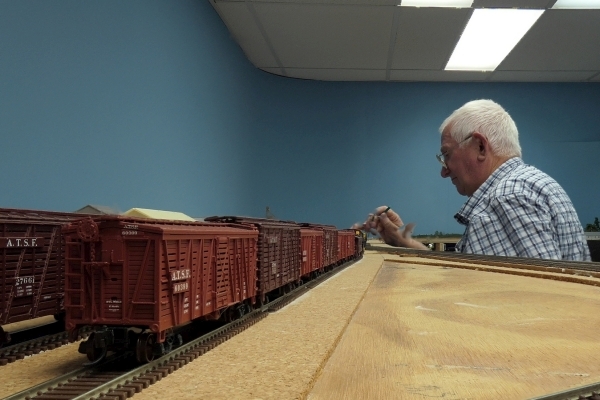 John F (yardmaster at Ardmore) is checking the paperwork for the cars from Darren's local freight. main track for the trip to Big Canyon. 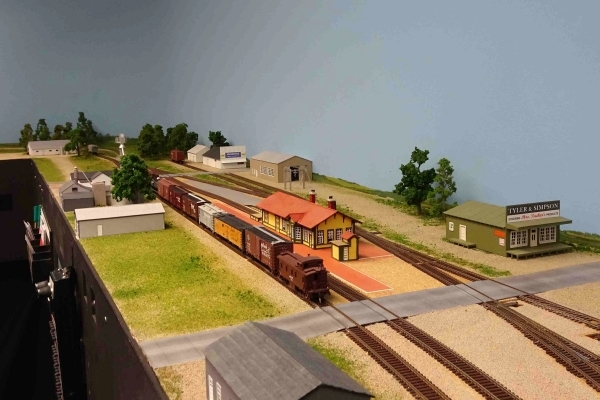 Barry has brought the Ringling branchline train into Ardmore and is about to move the combine to the house track. but I guess it was a good idea at the time. in the distant background. Sorry about that, guys. 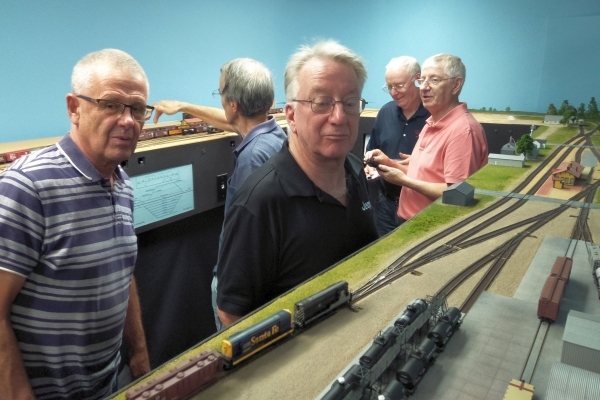 I had ten guest operators for this session, which is one or two more than we usually have, and most of the guys didn't spend a lot of time running trains. But judging by the amount of lively chat, I think they had a good time anyway. That's it for this report. My thanks go to all the guys who came over on Friday. I'm hoping to host the next session in mid or late March, probably on a Tuesday. 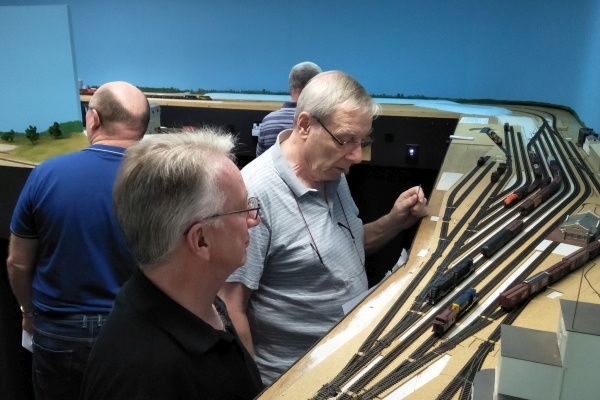 It has been two months since our last operating session on the GC&SF. 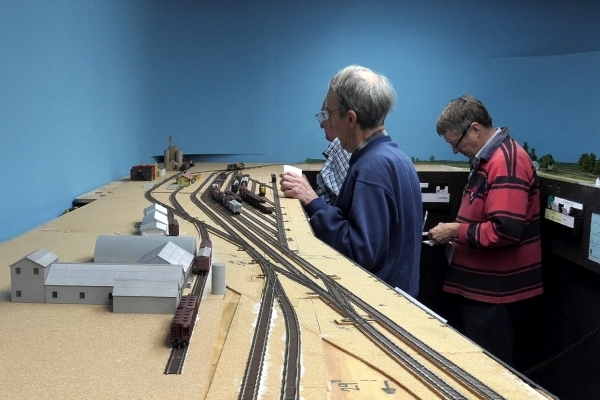 The layout has been restaged and ready-to-go for most of that time, and I was hoping to host a session this evening. However, family matters have intervened and I lost that opportunity. 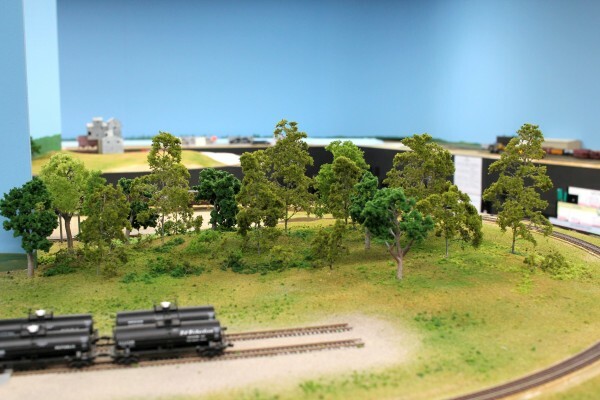 On the bright side however, I've been able to spend some time working on structures and scenery for the Wynnewood area of my layout. In particular, I've been making trees. 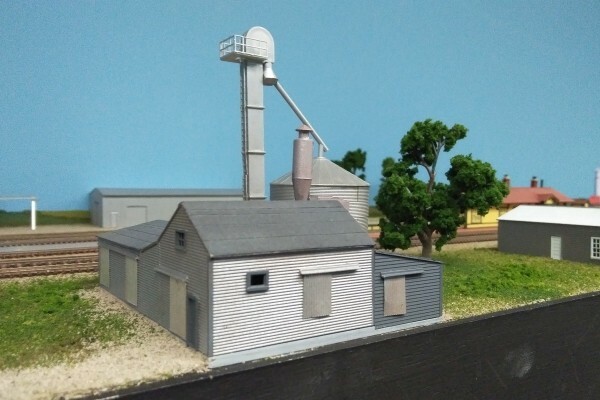 The title of this post comes from the fact that the structures I've been working on most recently have all been demolished since I built my models. 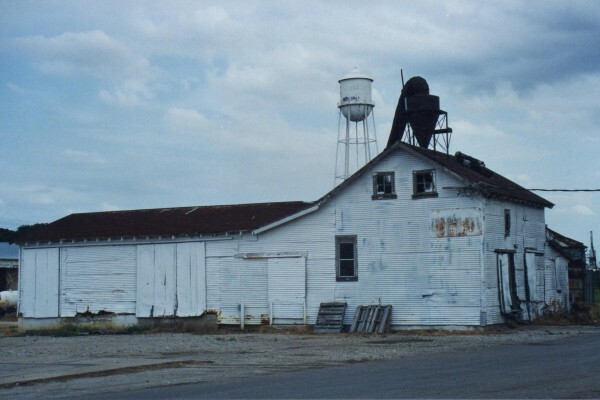 I don't know whether this structure existed in 1960, and it is not shown on the 1942 Sanborn insurance map. The building looked like this when I built my model, but not long afterwards it caught fire. A few years later the remains were demolished, and all that's left now is the concrete slab. 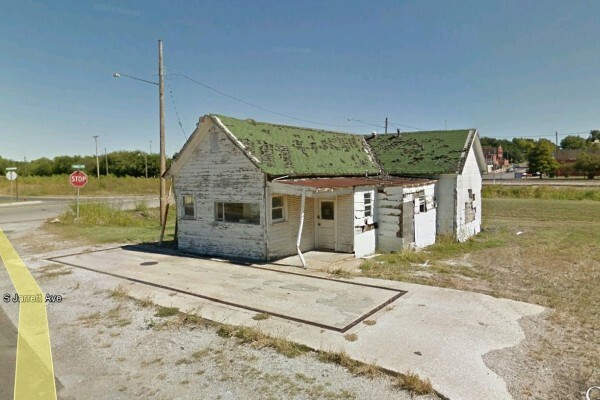 Google Earth imagery showed a large door on the rear of the building, that backed onto a double-ended siding, so I assume that at one time the industry here was served by rail. At the time of this photo, the occupant was Martin Fertilzer, and that's the name I've gone with. 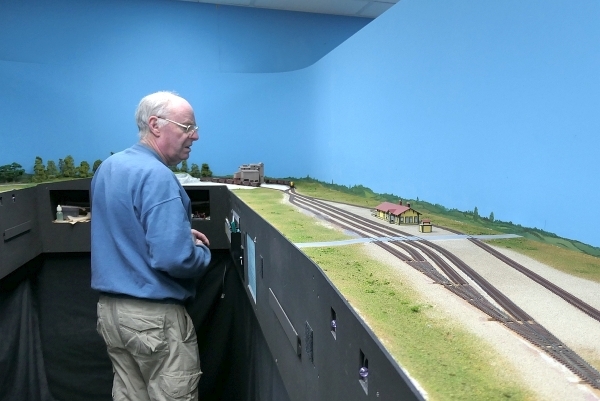 These next two structures were inspired by real buildings that were located near the railroad tracks but were not rail-served. Both are shown on the 1942 Sanborn map. 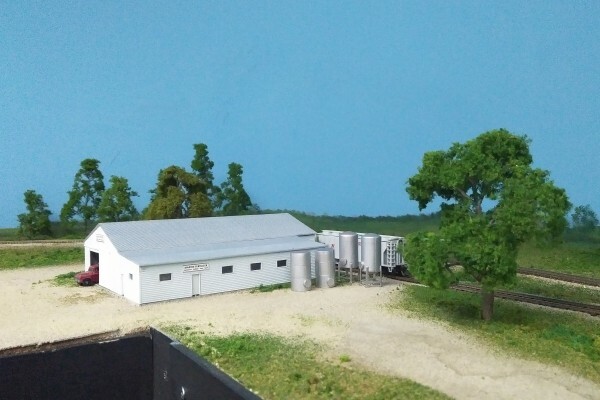 The first is a public weigh-station, and the second is a small feed-mill. 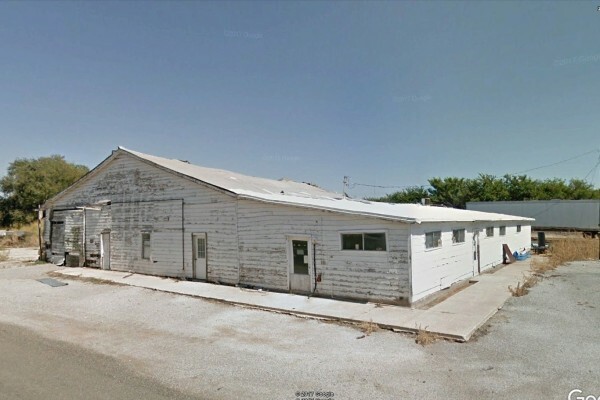 This afternoon I tried to download a photo of these two buildings from Google Earth Streetview, only to discover that the latest Google imagery shows them both to be gone. 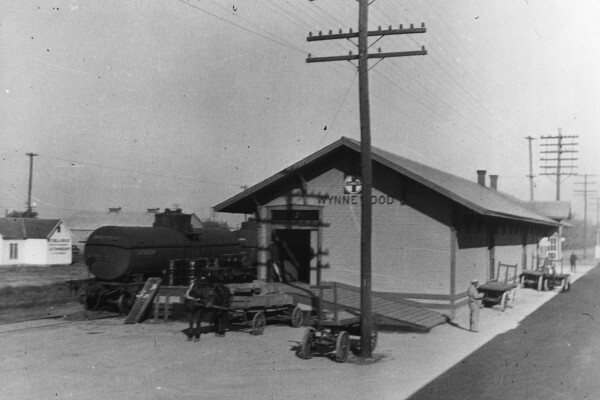 The weigh-bridge building is visible on the left-hand side of the followings photo of Wynnewood station, showing just how close it was to the railroad. 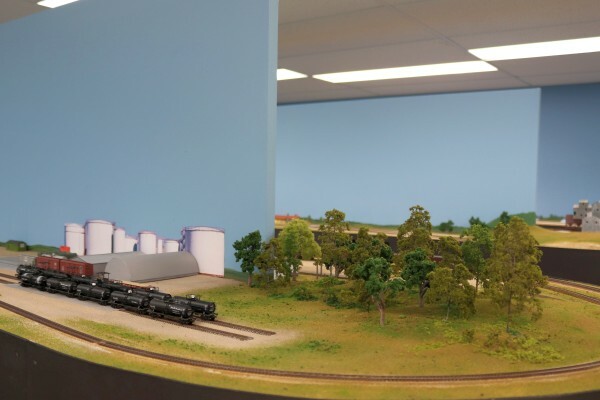 The siding that the tank-car is sitting on continued to the right, passing the rear of the building that was Martin Fertilizer. 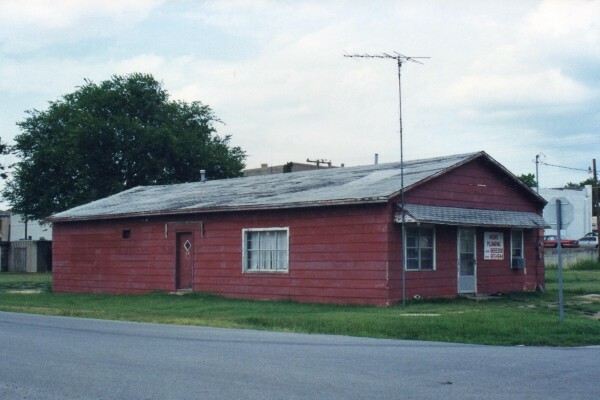 This last building was not located near the tracks at all, but I've liked it ever since Rod took some photos of it when he, John C and Vic visited Wynnewood back in 1998. 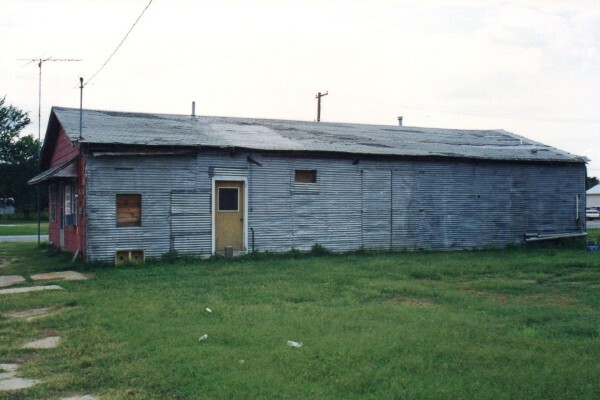 For some reason, two sides of the building were clad in red-painted timber, and two sides in corrugated metal sheeting. I didn't have any reddish paint in a spray-bomb when I painted my model, so I used dark grey instead. 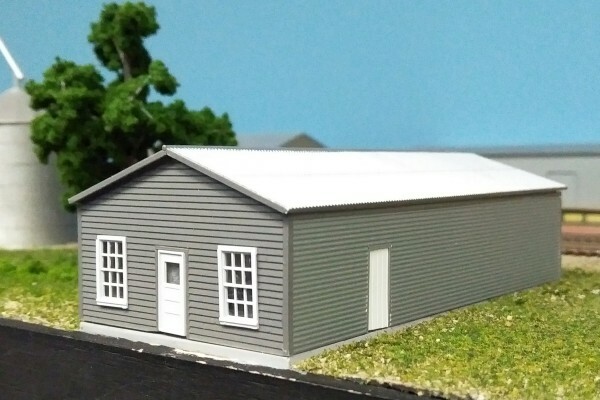 Unfortunately, the grey "timber" and silver "corrugated iron" appear to be the same colour in my photo. Someday, I might repaint the grey sides in red. That building, like the others, is now gone. 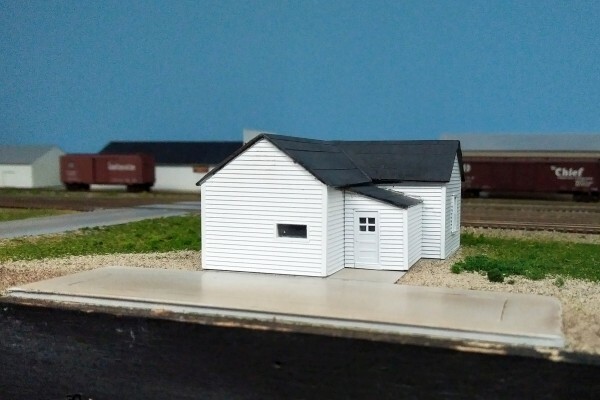 These three buildings are located right on the edge of the layout where they're likely to be bumped by operators, so I'm reluctant to add too much detail to them. 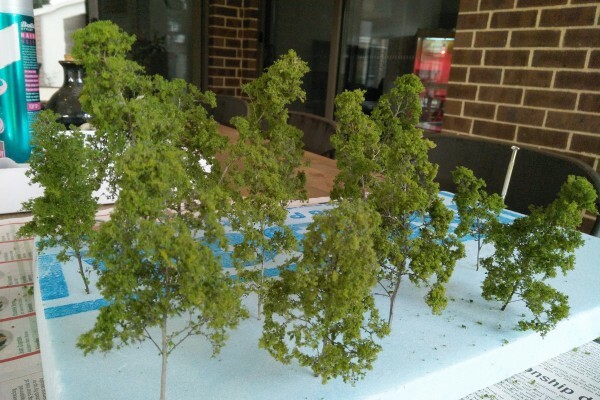 I've also been learning to make trees using Scenic Express SuperTrees and plastic tree armatures that I bought on ebay. Some of my trees are visible in the photos above, and I have several more batches to "plant". Thanks for looking. 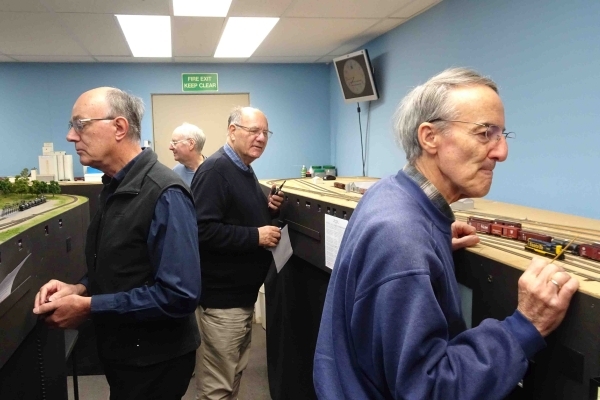 And thank-you to Rod for the photos.